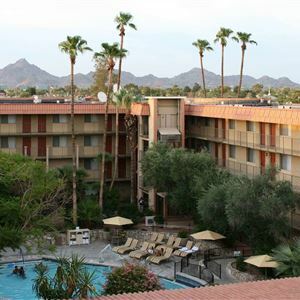 Property Location With a stay at Embassy Suites by Hilton Phoenix Airport, you'll be centrally located in Phoenix, convenient to Town and Country Shopping Center and Phoenix Theatre. This hotel is within close proximity of Biltmore Fashion Park and Celebrity Theater. Rooms Make yourself at home in one of the 182 air-conditioned rooms featuring kitchenettes with refrigerators and microwaves. 32-inch LED televisions with cable programming provide entertainment, while wireless Internet access (surcharge) keeps you connected. Conveniences include desks and complimentary newspapers, and housekeeping is provided daily. Amenities Don't miss out on the many recreational opportunities, including an outdoor pool, a spa tub, and a 24-hour fitness center. This hotel also features wireless Internet access (surcharge), concierge services, and gift shops/newsstands. Guests can catch a ride on the complimentary shuttle, which operates within 3. 00 mi. Dining Satisfy your appetite at the hotel's restaurant, which serves lunch and dinner, or stay in and take advantage of room service (during limited hours). Mingle with other guests at a complimentary reception, held daily. Quench your thirst with your favorite drink at a bar/lounge. A complimentary cooked-to-order breakfast is included. Business, Other Amenities Featured amenities include a 24-hour business center, limo/town car service, and express check-out. Planning an event in Phoenix? This hotel has 1950 square feet (181 square meters) of space consisting of conference space and meeting rooms. A roundtrip airport shuttle is provided for a surcharge (available 24 hours), and self parking (subject to charges) is available onsite. With a stay at Embassy Suites by Hilton Phoenix Airport, you'll be centrally located in Phoenix, convenient to Town and Country Shopping Center and Phoenix Theatre. 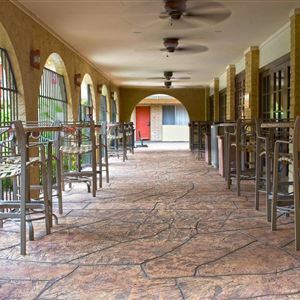 This hotel is within close proximity of Biltmore Fashion Park and Celebrity Theater. Make yourself at home in one of the 182 air-conditioned rooms featuring kitchenettes with refrigerators and microwaves. 32-inch LED televisions with cable programming provide entertainment, while wireless Internet access (surcharge) keeps you connected. Conveniences include desks and complimentary newspapers, and housekeeping is provided daily. Don't miss out on the many recreational opportunities, including an outdoor pool, a spa tub, and a 24-hour fitness center. This hotel also features wireless Internet access (surcharge), concierge services, and gift shops/newsstands. Guests can catch a ride on the complimentary shuttle, which operates within 3. 00 mi. Satisfy your appetite at the hotel's restaurant, which serves lunch and dinner, or stay in and take advantage of room service (during limited hours). Mingle with other guests at a complimentary reception, held daily. Quench your thirst with your favorite drink at a bar/lounge. A complimentary cooked-to-order breakfast is included. Featured amenities include a 24-hour business center, limo/town car service, and express check-out. Planning an event in Phoenix? This hotel has 1950 square feet (181 square meters) of space consisting of conference space and meeting rooms. A roundtrip airport shuttle is provided for a surcharge (available 24 hours), and self parking (subject to charges) is available onsite.